Exciting times in the world of Laish. I am like a giddy cackling child with a new glockenspiel at the moment. So many projects are happening at the same time which are getting my blood racing. 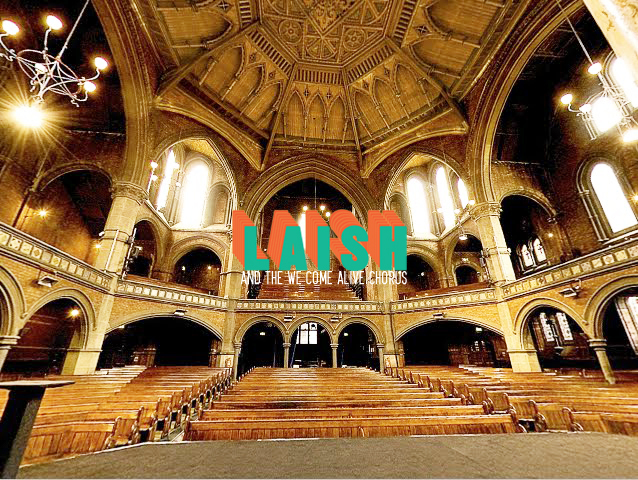 First up, I have been invited to perform at The Union Chapel (pictured) on March 7 at midday. Now this I do not take lightly. I have been to this incredible venue many times and watched countless musicians neglecting to acknowledge the fact that they are playing in The Union Chapel, not say, a pub, or their mum’s bakery. What I have learned is that acoustic instruments and voices work amazingly well. Drums, synths, electric guitars and lycra don’t really. So with this in mind, I will be performing on acoustic guitar joined by Tom Chadd on piano, and a lovingly assembled choir called The We Come Alive Chorus made up of members of Sons of Noel and Adrian, The Mariner’s Children, Scarlet Starlings and Kristin McClement who will be singing with me. I’m so excited at the moment, I can barely remember to tweet. It’s also my birthday that weekend and I really like cheesecake. So come join in and be a part of this rare event. They only ask for £3.50 on the way in. And if that wasn’t enough. We Come Alive, my new venture at The Harrison, has another amazing gig coming up on March 15th. I’ve persuaded the legendary Rachael Dadd to perform her first and only show of this year with a full band. Her last album, We Resonate, is such a warm, rhythmical, textured piece of work and I’m so happy she agreed to do this one. And to support? Kristin McClement from Brighton who has just released the best album of this year IMHO. And to open? Laish and the We Come Alive Chorus doing a reprise of the Union Chapel set of course! You really should pick up a ticket while they still remain. Those who know, it’s a very cosy room. There is more news to come, but that’s off in the future and, who knows, we could be 3D printing our halloumi burgers by then. PS A CALL TO ACTION! Would you do me a favour please and go to my facebook page and like it (if you haven’t already). Someone told me I have an embarrassingly small number of likees and frankly, it hurt. So come on, if you like me, why not LIKE ME? !